GOROKA, Papua New Guinea, Aug 11 2015 (IPS) - It has only been six months since Iveti, 37, lost her husband of 18 years, but already she is facing hardship and worry about the future. Similar to many married women in the rural highlands region of Papua New Guinea, a southwest Pacific Island state of seven million people, she stayed at home to look after their two children, a daughter aged 11 and a son now in his early twenties, while her husband’s income paid for the family’s needs. “I worry about food; I worry about bills and the children. I worry about the relatives who come and visit to mourn with us, because we have to kill a pig [for a feast] or give them something. Who is going to come and say they have the money for all this?” Iveti frets as she sits in her modest home on the outskirts of Goroka, a town in Eastern Highlands Province. She is surrounded by her children, and her husband’s mother and sister who also live with her. “There was always food there to serve my children, but now the man who provided the food has gone. On the days we don’t have food I make ice-blocks and sell them at the market. We get 20 kina (seven dollars) or 30 kina (10 dollars). Every two days we pay about 20 kina for the power and with the 10 kina (about 3.60 dollars) which is left, we buy a tin of fish. “My daughter goes to school and we budget 4 kina (just over a dollar) for her lunch,” she continued. 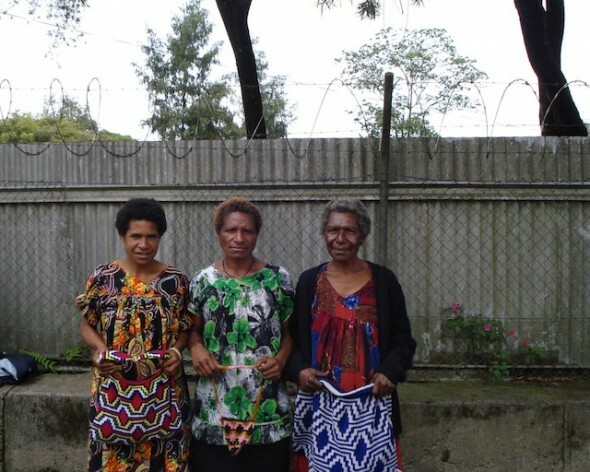 There is a diversity of widows’ experiences in Papua New Guinea. Those who have completed secondary or tertiary education and have an independent source of income are in a strong socio-economic position to look after themselves and their children. However, more than 80 percent of the population resides in rural areas where many women have limited access to education and employment. Female literacy in the Eastern Highlands, for example, is about 36.5 percent. Gender inequality in the country is exacerbated by social practices, such as early and forced marriage, bride price and widespread domestic and sexual violence experienced by two-thirds of women in the country. While there are no accurate statistics available about widows in Papua New Guinea, the national Widows Association claims that most have been in widowhood for between five and 30 years. For women in the highlands, the risk of losing a husband is increased due to the prevalence of tribal warfare. Outbreaks of fighting between different clan groups can be triggered by disputes over landownership or pigs, the most prized livestock, or ‘payback’ for a wrong committed against a community. And, in most cases, the death of a male warrior plunges the wife and children into a precarious existence. Families are also being impacted by the HIV/AIDS epidemic. By 2010, 31,609 cases of the virus had been reported with the highest prevalence of 0.91 percent recorded in the Highlands, slightly higher than the national rate of 0.8 percent, which is estimated to have decreased to about 0.7 percent last year. When a husband dies, the widow and children usually have the right to remain on the husband’s land and property. But this is often not the case if AIDS, which is accompanied by social stigma, has been the cause of death. Agatha Omanefa, Women’s Project Officer at Eastern Highlands Family Voice, a non-governmental organisation dedicated to counselling and supporting families, told IPS that while extended families were traditionally very protective of vulnerable members, she had witnessed rising cases of brothers of the deceased husband making moves to claim the land. When “the husband’s relatives come in to share the properties the widow becomes a loser with her children […]. Sometimes they come up with stories, history, such as: ‘you are from there, your husband is from here’ and then she [the widow] needs someone to support her to secure the land,” she explained. Families in Papua New Guinea are traditionally large with up to eight or 10 offspring, and the struggle includes paying for children to complete education, especially to secondary level. Female headed households are several times more likely to be below the absolute poverty line, according to government reports. But one of the greatest threats to a widow’s welfare is the risk of being accused of sorcery. In nearby Simbu Province, women aged 40-65 years are six times more likely than men to be blamed for using witchcraft to cause a death or misfortune in the community, reports Oxfam, and the consequences, including torture and murder, can be tragic. “There is growing concern that sorcery accusations that lead to killings, injuries or exile are often economically or personally motivated and used to deprive women of their land or property,” the United Nations Special Rapporteur on Violence against Women, Rashida Manjoo, reported in 2013. Widows with sons, however, have a source of protection. “In our culture in the Highlands, when you have a son, no-one will chase you out, because you will gain strength from your son, but if a woman does not bear any child then she is more vulnerable,” Irish Kokara, treasurer of the Eastern Highlands Provincial Council of Women, explained. President Jenny Gunure added that there was also a lack of awareness about women’s rights and the law at the village level, a situation the women’s council is working to rectify through a bottom-up education programme aimed at rural women, which was begun last year. However, Kokara believes that the risk of violence will not diminish until the behaviour of young men, who often perpetrate such crimes as part of vigilante gangs, is addressed. “It is the youths who take drugs, like marijuana, who are the ones burning the women and hanging them on trees. So we need to change the youths first, then we can change the community,” she declared. In recent weeks widows across the country have called through the local media for the government to introduce legislation to better support recognition of their rights.